Latest data from DECC (Department of Energy & Climate Change) shows that in January 2016, the last month of the old Feed In Tariff (FIT) regime, there were 18,400 domestic solar PV registrations of 4kW or less systems. This is a 124% increase on January 2015 when there were 8,200 registrations. The January 2016 installations added 53 MW of electricity generation capacity at peak output with an average system size of 2.9kW. 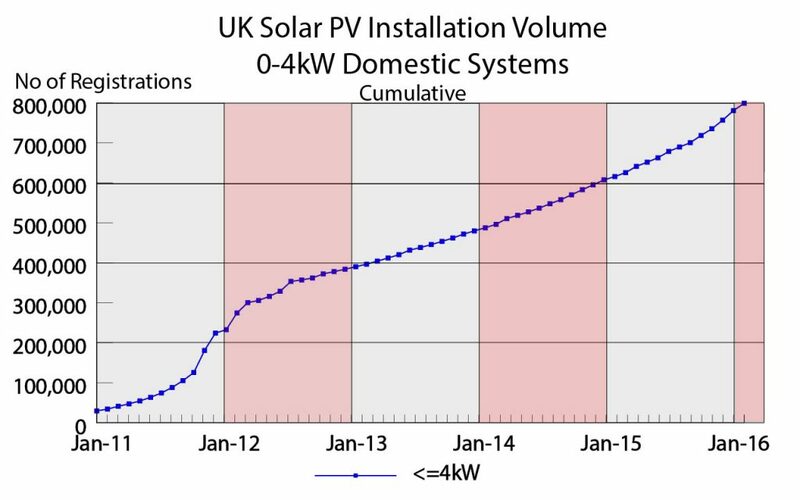 Installation levels of larger domestic systems (4kW-10kW) also rose from 1,000 in January 2015 to 4,800 in January 2016. 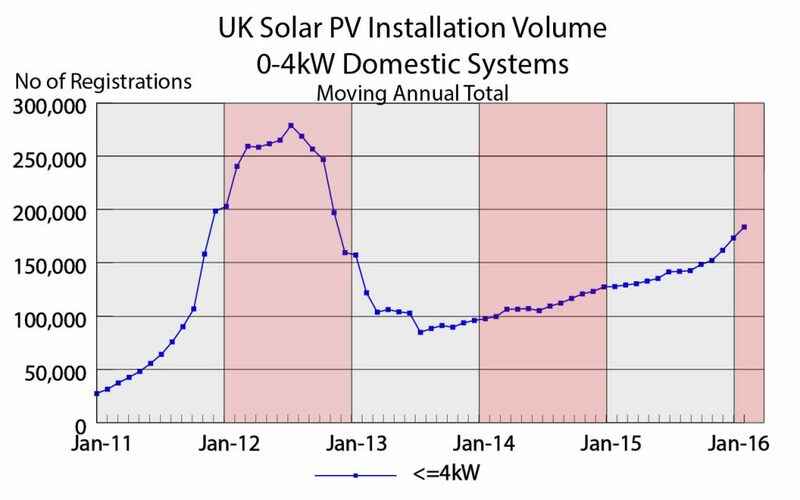 After the five month rush to beat the 15th January FIT close date we are likely to see a much quieter February and March 2016 for the domestic solar industry with big falls in installation levels on the 10,000 systems registered in February 2015 and the 15,600 systems in March 2015. 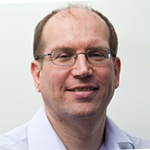 First indications of the February 2016 data should be available before Easter. DECC also revised data for 2015. In 2015 as a whole there were 173,300 domestic installations (4kW or less) compared with 127,400 for 2014. For 2015 this added 512MW of peak electricity generation with an average system size of 3kW. 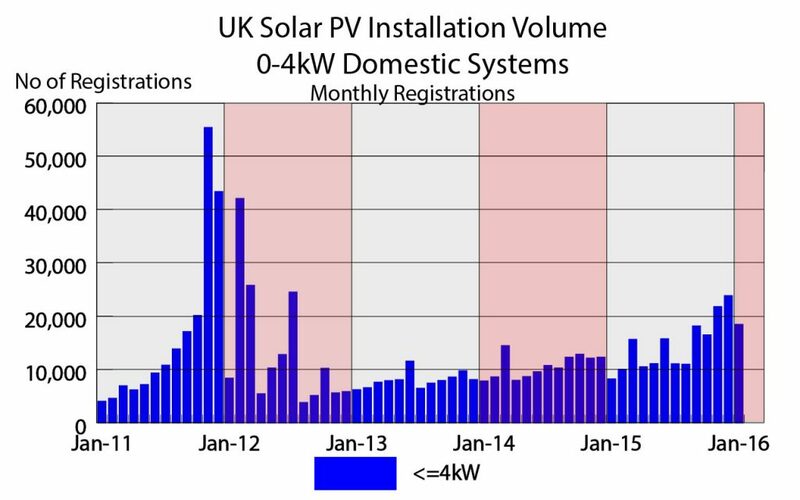 2015 turned out to be the best year for domestic installations (0-4kW) in terms of volume of registrations since 2011. With the big reduction in FIT payments for new installations from February onwards, 2016 is likely to see a much lower level of domestic installations. Our forecast is for around 70,000-80,000 systems (0-4kW) in 2016. Cumulative domestic installations (0-4kW) under the Solar FIT scheme are now touching 800,000 homes or about 3% of the 26.7 million homes in the UK. 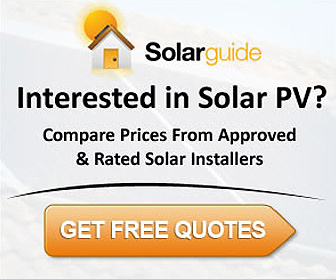 In addition there are about 20,000 larger domestic installations (4-10kW) registered for FIT. Cumulative installed capacity (0-4kW) under the Solar FIT scheme is now close to 2,500 MW or 2.5 GW. This is the peak output likely on a sunny day. Typically UK power demand varies between 30GW and 50GW so domestic solar has some way to go before it makes a big contribution to grid supply, especially on a cloudy winter day where domestic solar output of 0.25GW is probably more realistic.